Click for a list of upcoming scheduled executions in Texas. The death penalty puts innocent people at risk of execution. Todd Willingham was wrongfully executed under Governor Rick Perry on February 17, 2004. Timothy Adams’ parents, Columbus and Wilma Adams, and his brother Chadrick, are among those asking the Texas Board of Pardons and Paroles to intercede, something the board has only done twice during Gov. Rick Perry’s tenure. In a session fraught with emotion and tears, family and friends of killer Timothy Wayne Adams on Tuesday publicly called on the state’s pardons board to spare the life of the one-time security guard who is to be executed later this month for the murder of his 19-month-old son. The public plea came one day after the Texas Defender Service formally asked the board to recommend that Gov. Rick Perrycommute the 42-year-old man’s sentence to life in prison. During Perry’s tenure, the board only twice has recommended commutation, and the governor on both occasions allowed the executions to proceed. Defender Service lawyer Katherine Black said Adams has exhausted his court appeals. Both the elder Adams and his wife, Wilma, said they have forgiven their son. The condemned man’s parents said they visit him as often as once a week, and as relatives, church colleagues and friends gathered at the Adams’ northeast Houston home, a death row photo of the killer stood in a place of honor on a living room table. Adams is set to die Feb. 22 for the Feb. 20, 2002 murder of Timothy Adams Jr., whom he shot during a standoff with police at his home. The police siege grew out of a dispute between Adams and his wife, Emma, who was in the process of moving out of the couple’s residence. During the episode, Adams also threatened to commit suicide. 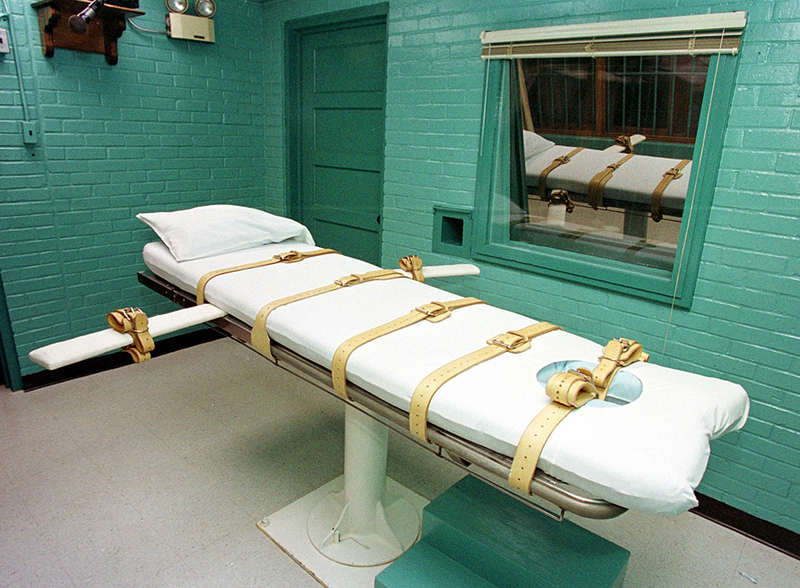 Timothy Adams is scheduled to die in Texas by lethal injection on Feb. 22. Today, his lawyers, family members and three of the jurors who sentenced him to death sent a clemency petition to the Board of Pardons and Paroles. Adams and his supporters say that at his original trial, jurors never heard mitigating information about his past that could have changed their sentencing decision. He was an Army veteran and a Houston security guard who had never been arrested until February 2002, when a fight with his wife sent Timothy Adams into a suicidal spiral. During a stand-off with police, Adams fatally shot his 19-month-old son twice in the chest — landing him a spot on death row. Adams is scheduled to die by lethal injection on Feb. 22. Today, his lawyers, family members and three of the jurors who sentenced him to death sent a clemency petition to the Board of Pardons and Paroles and to Gov. Rick Perry, asking them to commute Adams’ sentence to life in prison. Adams and his supporters say that at his original trial, jurors never heard mitigating information about his past that could have changed their sentencing decision. Jurors Rebecca Hayes, Ngoc Duong and Kathryn Starling said had they known more about Adams’ religious background and his hard-working, family-oriented character, they would not have sentenced him to death. “Those deliberations were the most emotional experience of my life, and I have carried the guilt around for years knowing that I sentenced Adams, a man who had done wrong but who was otherwise a good, religious, and hard-working person, to death,” Hayes said in a sworn statement. 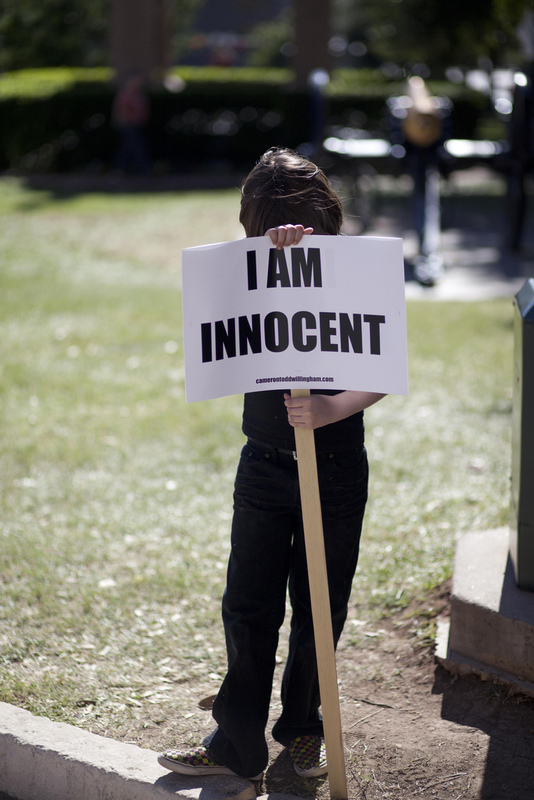 A new documentary entitled “Incendiary” about the Todd Willingham case will have its world premiere at the 2011 SXSW film festival. We will make a trip to the premiere with the participants of the Anti-Death Penalty Alternative Spring Break. Watch an excerpt sequence at the Texas Tribune. Check out the official website for the film. Follow the film on twitter. INCENDIARY is the true story of the conviction and execution of Cameron Todd Willingham for the arson murder of his three children in 1991, and of the resulting scientific, legal and political firestorm that rages today. A potential landmark death penalty case, Willingham’s execution based upon junk science begs re-examinations of other arson convictions, criminal prosecution for obstructors of due process, and a re-evaluation of the law’s ultimate punishment. Equal parts murder mystery, forensic investigation and political drama, INCENDIARY documents the haunted legacy of a prosecution built on ‘folklore’. The filmmakers are Austin’s own Steve Mims and Joe Bailey. Steve Mims’s award-winning shorts and features have screened in festivals and on television. He teaches at UT Austin. INCENDIARY is UT Law graduate Joe Bailey, Jr.’s first feature-length film. He works as a cinematographer and sound recordist in Austin. Yesterday Rep. Harold Dutton of Houston filed HB 852, his bill to abolish the death penalty in Texas. He first filed his bill to abolish the death penalty in 2003, which was the first abolition bill filed in a long time up to that year. It was an exciting day back in 2003 when Dutton’s abolition bill was heard in the House Criminal Jurisprudence Committee. Rep Jessica Farrar has also filed a bill to abolish the death penalty (HB 819). Farrar first filed her abolition bill in 2007, following the lead of Rep Dutton who has filed an abolition bill every session since 2003. The Texas legislators who filed or signed on as co-authors to the death penalty abolition bills in 2009 were Harold Dutton, Jessica Farrar, Terri Hodge, Marisa Marquez, Lon Burnam and Al Edwards. (Hodge and Edwards are no longer members of the Legislature in 2011). Many people and some newspapers have criticized the Texas Forensic Science Commission for carrying on much of its discussions about the Todd Willingham case behind closed doors, either when the subcommittee meets or during executive sessions of the full committee. At last Friday’s meeting on Jan 21, the Commission again went behind closed doors for about an hour. When they returned they decided to seek an opinion from the Texas Attorney General about whether the Commission has jurisdiction in the Willingham case. Here is a video of Chair John Bradley announcing the Commission will go behind closed doors to confer outside the view of the public.